Check List for Adding a New WordPress Post – Tutorial! This is a wordpress guide that will help you remember all those pesky little details that are essential when posting content onto your blog/website. Blog or website, they are pretty much all integrated these days. If your a client of Grover Web Design and you don’t know if you have a WordPress site… you don’t. If your interested in upgrading please contact us at: [email protected]. Ok, lets get to it. I will be conducting this tutorial using Jack of All Thoughts as an example. Sorry if you check out the website and its a bit crude… talk to Tommy S about that! Jack of All Thoughts just has the most features thats why I am using it. Some people suggest writing your article outside of WordPress. This eliminates any problems with internet connection. I am up in the air about this one, personally I just write the articles right in WordPress and never really have a problem. If you took suggestion 1, cut and paste your article into WordPress. Add the title with strong keywords specific to your article and review everything. 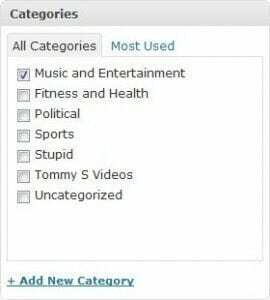 Next, specify the category or categories that you would like to place your post into. Uncategorized articles are ugly, get lost, and bring no SEO value to your site. Also, I check sites often and will scold you for making a mistake. A lot of sites are set up where the category of a post will determine what page it will be put on. i.e. video category will go to the video page. Do an SEO evaluation of your post. Does your title have keywords in it that you want to target for your article? Have you filled out the “All in One SEO Pack” or “Genesis SEO Settings”? If you do not know much about this please read this article on SEO for your blog post. Please comment below about what we need to add into this article.